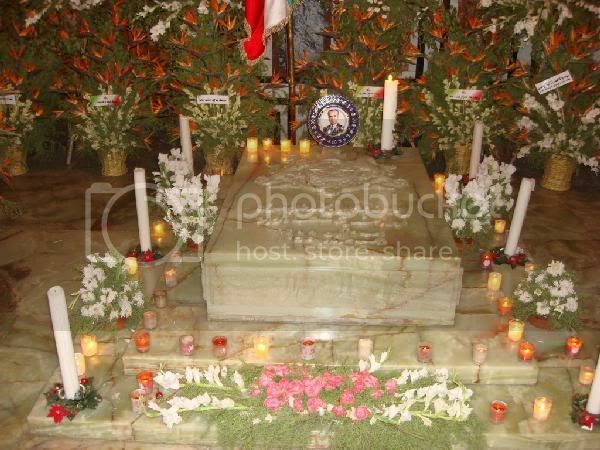 Many Iranians paid their respects at His Imperial Majesty's resting site on October 26, along with Egyptians and other foreigners in Cairo (Egypt). In the above photo Iranian girl "Yar" pays her respects. 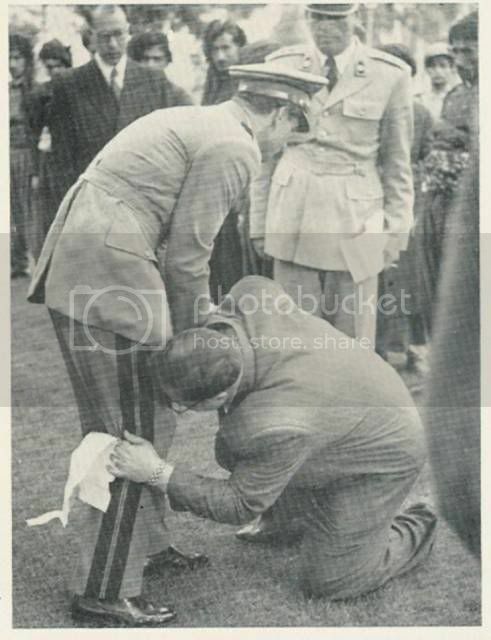 His Imperial Majesty will forever be the King of Hearts to true Iranians. 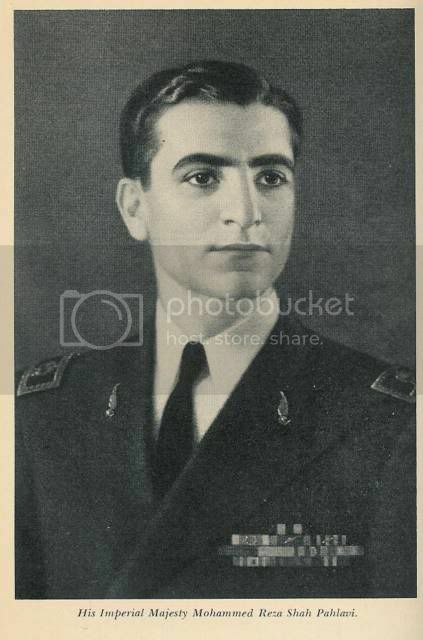 9 Aban Zaadrooze Shahe Iran, Reza Pahlavi II, Khojasteh Baad! Twenty five centuries ago, when savagery was the dominant factor in human societies, a civilized and compassionate declaration was written on clay and issued to the “four corners of the world” that dealt with important issues relevant to the rights of humans, the same issues that not only in those days but even today can inspire those who believe in human dignity and rights. This document, known as “The Declaration of Cyrus the Great,” emphasized on the removal of all racial, national discrimination and slavery, bestowing to the people, freedom to choose their places of residence, faith and religion and giving prominence to the perpetual peace amongst the nations. This Declaration could actually be considered as a present from the Iranian people, expressed through the words of Cyrus, their political leader and the founder of the first empire in the world, to the whole humanity. In 1971, the general assembly of the United Nations recognized it as the first Declaration of Human Rights, thus, registering such an honor to the name of Iran as the cradle of this first historical attempt to establish the recognition of human rights. Unfortunately, today, Iran is considered a country whose people are deprived of the very rights that were discovered, articulated and expressed by themselves. The body that holds the state apparatus in Iran not only does not recognize such “rights,” but has done much (intentional and/or unintentional) harm to the mausoleum of Cyrus the Great in Pasargad plains – the very monument that has been registered by UNESCO as a human heritage and a “shrine,” causing its immanent destruction in the future. The International Committee to Save Pasargad that was shaped three years ago by a large number of people who appreciate national and world heritages, would like to use the opportunity of Cyrus’s Day to extend its best and warmest greetings for the occasion and repeat its plea to all those who appreciate the importance of Human Rights and its historical symbol in the shape of Cyrus’s mausoleum, to put maximum pressure on United Nations, and especially UNESCO, to use their utmost effective endeavors to save this invaluable treasure of human civilization. 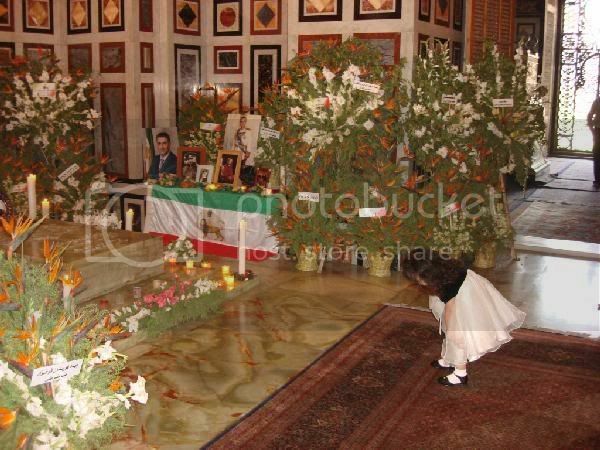 Today we remember a man whose heart and soul was with us Iranians and our homeland. He served us to the best of his ability and loved us with all his might. Like a caring father he wanted us to excel in everything we did. He wished us nothing but the best and provided us with as much as he could in the little time he had with us. We were proud as his children and people looked at us with respect everywhere we went. Today, if he was with us he would want us to fight to regain what he had wished for us and for Iran. It is up to us today to come together and respect his wishes. It is the least we could do for his legacy. Let us also on this occasion, honor the services of those men and women in the diplomatic corps and military cadre who loyally served their King and Country. May generations of Iranians to come dedicate themselves to the paths of these visionaries and protectors of Iran. God bless them. On Monday 15 Oct 2007 Lady Liberty in New York City met a similar Iranian symbol, the Derafshe Kaviani, or Royal Standard of the Sassanid Emperors. The Kaviani Standard is a symbolic representation for Iranian independence and resistance against foreign tyranny. 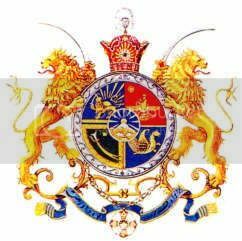 The name Derafš-e Kāvīān (Modern Persian: Derafš Kāvīāni درفش كاويانى) means "the standard of the kay(s)" (i.e., kavis "kings") or "of Kāva." The latter meaning is an identification with an Iranian legend in which the Derafš-e Kāvīān was the standard of a mythological blacksmith-turned-hero named Kāva (Modern Persian: Kāveh), who led a popular uprising against the foreign demon-like ruler Dahāg (Modern Persian: Zahhāk). Recalling the Sassanid-era legend, the 10th century epic Shāhnāma recasts Zahhak as an evil and tyrannical Arab, against whom Kāveh called the people to arms, using the blacksmith's leather apron on a spear as a standard. In the story, after the war that called for the kingship of Fereydun (Middle Persian: Frēdōn) had been won, the people decorated the apron with jewels and the flag became the symbol of Iranian independence and resistance towards foreign tyranny. By the late Sassanid era (224-651), a real Derafš-e Kāvīān had emerged as the standard of the Sassanid dynasts. It was thus also representative of the Sassanid state - Ērānshāhr, the "Kingdom of Iran" - and may so be considered to have been the first "national flag" of Iran. The banner consisted of a star (the akotar) on a purple field, was encrusted with jewels and had trailing red, gold and purple streamers on its edges. The term akotar was significant since the star also represented "fortune", and the capture and destruction of the banner on a field of battle implied the loss of the battle (and hence the loss of fortune). Following the defeat of the Sassanids at the Battle of al-Qādisiyyah, the Sassanid standard was recovered by one Zerar bin Kattab, who received 30,000 dinars for it. After the jewels were removed the caliph Omar is said to have burned the standard. It's with this in mind that the Assembly of Iranian Cultural Renaissance launched a symbolic operation of flying this ancient Iranian banner over the Statue of Liberty and the UN Headquarters, as it represents the Iranian nation's struggle for independence and resistance against foreign tyranny - in this case the terrorist Islamic Republic which has occupied Iran for 28 years and oppressed its people with the foreign and anti-Iranian ideology of Islam. 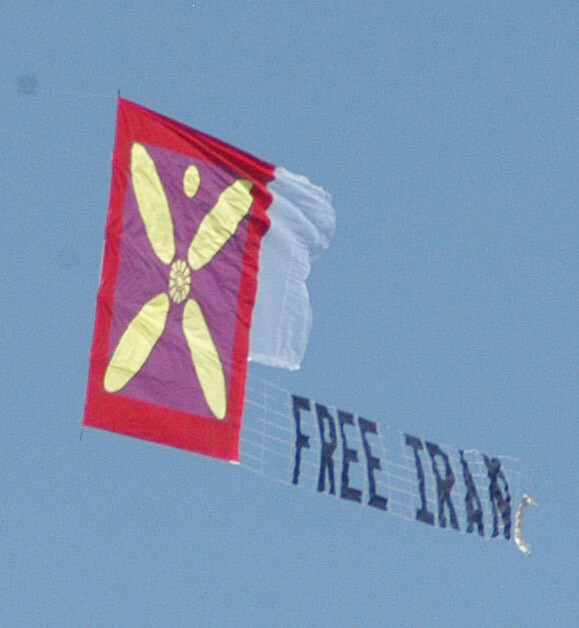 The Statue of Liberty in New York will on Monday October 15, 2007, proudly look on as Iran’s ancient flag of Kings, Derafshe Kaviani, flies overhead to signal the revolt of Iranians of every country, language, and religion against Iran’s repressive Islamist regime of Mullahs. 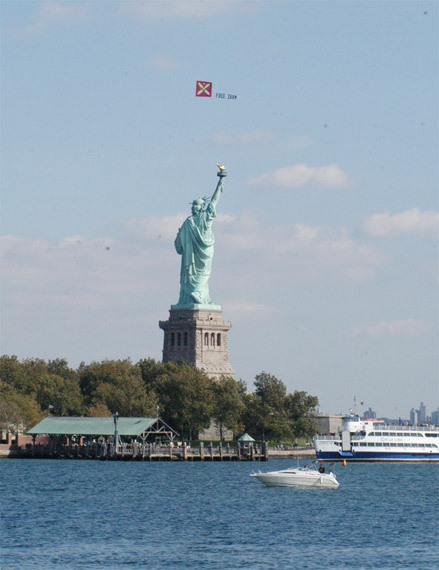 The 25 x 25 foot Derafshe Kaviani will fly along Long Island, over the United Nations, and circle New York Harbor and the Statue of Liberty. The flight is timed to coincide with the ancient Iranian festival of Mehregan, the fall festival that also celebrates an ancient victory over oppression at which this flag was unfurled. Derafshe Kaviani was first raised, according to legend, against the Satanic, evil dragon demon Zahak. In Iran’s national epic, Shahnameh Ferdowsi, the demon has become an oppressive Arab ruler. Kaveh Ahangar, the legendary blacksmith rallied the people against him, using his spear and leather apron to remake the ancient flag and lead the people to victory. See clip of the news report put on youtube HERE. The persian version of this press release can be downloaded HERE. A local newspaper "Staten Island Advance" reported on this event HERE. To view the website of the "Assembly of Iranian Cultural Renaissance" click HERE. The Kaviani Standard has been unveiled in many symbolic acts of protests in past years - here's one where it was unfurled on top of the Arc de Triumph in Paris - click HERE. Similar actions have taken place outside the EU Parliament in Brussels and the International Criminal Court in the Hague and elsewhere across the world. 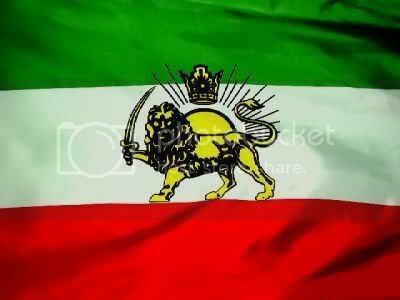 Derafshe Kaviani is our flag. It was the flag our Persian army, our pride and our identity. Those behind this beautiful act are real Iranians, real sons of Cyrus, Darius, Yazdgerd and Nikbanou, Irandokht. Our Persian ancestors were the envy of others, for their sofistication, culture and love. I'm proud of being their descendant. However, my country Iran was invaded by the dirtiest and lowest of the low, the Arabs. Who literally raped and destroyed our beautiful culture. I'm against their descendants in Iran, not elsewhere. Against their diffrent ramifications, Seyyeds, Hezbolahi, akhoond and many others who 'by default' hate Persians and hate our pre-islamic heritage. That's why some of you hate Drafshe Kaviani, hate our real calendar, hate our Persian and Iranians customs and culture. You descendants of the arab muhamad, ali the killer, hussain the jackass, you descendants of the lizard eaters of desert grab your crap and leave Iran, 'before' its our turn to take action. Get this staright: Islam doesn't belong to Iran, your damn reza, hasan and hussain and fatemeh, belong to arab lands. Iran belongs to real Iranians, not the low-class garbage descendants of Arabs and Moghols. 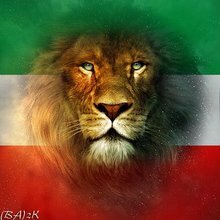 Iran belongs to: Ferdowsi, Babak Khorramdin, Yazdgerd, Sanbad, Nikbanou, Khosro, Cyrus, Xerxes, Pirooz, Rostam Farrokhzad, and to all other real Iranians. You don't belong to Iran. We'll kick you OUT of our dear Iran. Damn Arabzadegane maflook. 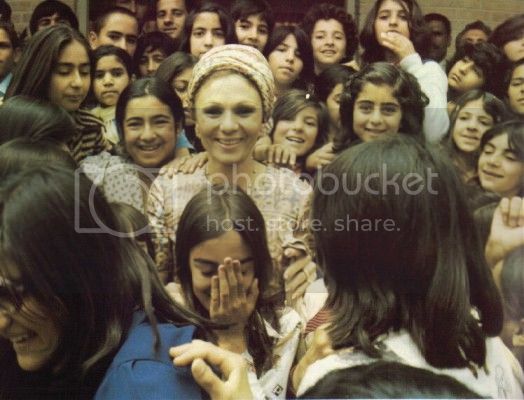 I would like to extend my warm felicitations and sincere good wishes to Her Imperial Highness Empress Farah Pahlavi of Iran who today celebrates her 69th birthday! 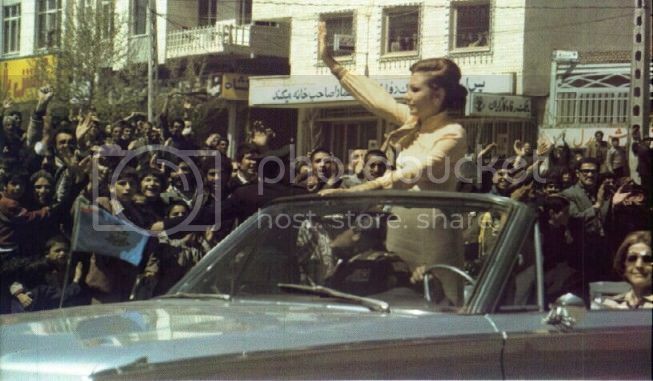 The Iranian people await the return of their Empress and with that a light of hope for a better tomorrow! Shahbanouye Gerami Zaadroozat Farkhondeh Baad! Dorood bar Banooye Banovan, Shahbanouye Mehraban! Long Live Live the Empress! On October 8 this week Mahmoud AhmadiNejad the President of the occupational Islamic Republic arrived at Tehran University were he was scheduled to give a speech. 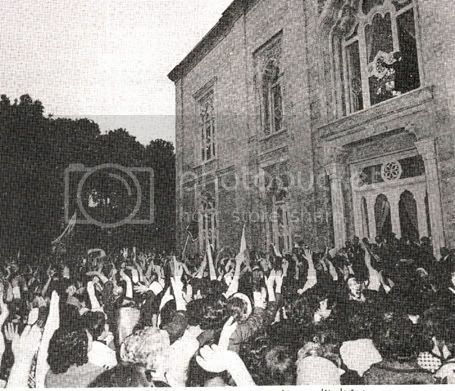 Heavy security and screening processes was in place to ensure that the few students allowed into the auditorium were regime-loyalists or basiji (a paramilitary organization consisting mainly of young disenchanted/indoctrinated villagers) so that no disruptions or complications need take place during the speech; knowing full well that if Iranian students were allowed into the auditorium there would not only be a security risk towards the Islamic Republic's president but also the fact that students would be able to pose obviously relevant questions which the regime to date has not been ready to answer (regarding the non-existence of freedom and democracy in Iran etc). Under the heavy presence of the terrorist Islamic Republic's armed security forces hundreds if not up to a thousand of Tehran University students were showcasing their public rejection of the illegal/occupational Islamic regime and its President Mahmoud AhmadiNejad within the university premises - the students were not allowed to leave the University premises but were locked onto campus. As Potkin says in his entry - the university was under a military siege as AhamdiNejad addressed his supporters. "Death to Dictator", "Free imprisoned students", "We have questions too, Why only Columbia?" , "Here is Columbia too", "In Columbia yes, in Tehran no? ", "Mahmoud Ahmadinejad source of poverty and corruption", "Freedom is our definite right", "Fashist government should be destroyed", "Shame on the regime leave the university", "student torture is condemned". "we don't want dictator regime, we don't want mercenary police", "political prisoners must be freed", "shame on police, leave the university", "Fashist president, university is not your place". See SOURCE for full list of references. Inside the National Iranian-American Council. Robert William (Bob) Ney is a current federal prisoner and a former Ohio Congressman from 1995 until November 3, 2006. On October 13, 2006 Ney pled guilty1 to charges of conspiracy and making false statements in relation to the Jack Abramoff lobbying and bribery scandal. Ney reportedly received bribes from Abramoff, other lobbyists, and two foreign businessmen – a felon and an arms dealer – in exchange for using his position to advance their interests. Conspicuously missing from this dossier of disservice to the country is Ney’s masterful creation of an active and disguised Washington-based lobbying enterprise for the Iranian theocratic regime, The National Iranian-American Council (NIAC). NIAC is an effective node of Tehran’s comprehensive US lobbying web. This article will address the creation of NIAC, the motives underlying its formation, NIAC’s manifesto, Tehran’s role, NIAC’s connection to Iran’s oil mafia, and NIAC attempts to penetrate the US political system. From that meeting, Darius, Dave and I began to work with Trita Parsi, another Iranian-American, to try to form a political action committee of Iranian-Americans to pursue a strategy of normalization of relations between the two countries. The 4 of us worked very hard for about 9 months to form this committee. Trita Parsi at the time was a Swedish-Iranian graduate student in his early twenties with ties to Iran’s ambassador in Sweden.3 He was working part-time as a Congressional aid in Ney’s office in Washington on a temporary visa. Parsi was subsequently appointed president of NIAC. Should we believe that one of the most expensive lobbying teams in the US, one of the most corrupt lawmakers in Washington and a Congressional aid in his office, none of them Iranian-American, worked hard for nine months out of their humanitarian concern for the Iranian people? In 2001, the pro-Iran lobby in the United States became intensely active to prevent the renewal of the Iran Libya Sanctions Act (ILSA), and to improve US-Iran relations. Despite extraordinary pressure from the lobby, ILSA passed overwhelmingly. 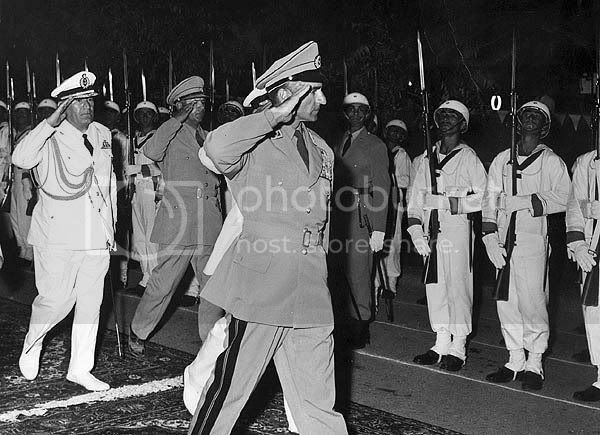 Prior to his imprisonment, Bob Ney, in concert with AIC, was Tehran’s dogged warrior in Washington as he relentlessly led Congressional efforts to end ILSA and initiate Tehran-friendly policies. Ney, disappointed and angered by the ILSA vote, began to plan for the next battle of the war. The ILSA vote doesn’t look very promising, but that doesn’t mean the struggle should stop on this entire issue. It is a matter of education and re-education and people getting together and forming a citizen’s lobby to make sure that members of Congress and their offices are educated on this issue. – Speech to AIC, June 2001,7 (Emphasis added). Hopefully, Tehran will recognize that an honest attempt was made to defeat or at least weaken the sanctions. The call for a review and Speaker Hastert's pledge to insist on Congressional action based on the review must also be interpreted by Tehran as a step in the right direction. 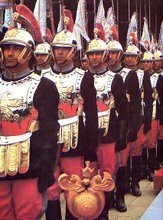 – IranAnalysis, July 2001, Peyvand’ Iran News. Their failure to block the renewal of ILSA marked the start of a new era for the pro-Iran lobby in the United States. The lobbyists recognized that they must broadly reach out to Iranian-Americans. Iran became directly involved in creating, organizing and implementing a far-reaching lobbying campaign in the US, fundamentally different in its organization, which targeted the strategic needs of Tehran’s rulers. The creation of NIAC as the main executer of this new endeavor had been meticulously planned since the late 1990s. Parsi stepped down from the board of directors of the AIC. An influential US Congressman and a posh Washington lobbyist came to Tehran’s help to create NIAC. An unknown Iranian Swedish student was selected to serve as president of this new organization. During the eight years of Rafsanjani’s presidency, which ended in 1997, the Iranian regime had attempted without success to attract the Iranian Diaspora to its cause. 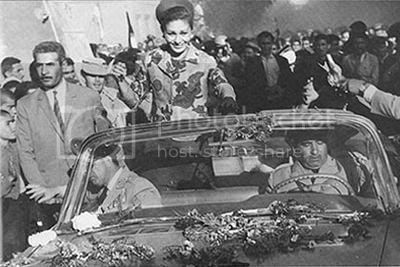 Khatami’s presidency recharged Tehran’s efforts. With the Supreme Leader’s direct involvement, the High Council for Iranian Compatriots Overseas9 was created in 2000 under the auspices of the Foreign Ministry. The President heads the Council, and the Foreign Minister serves as its deputy director. The Ministry of Intelligence and the Ministry of Culture and Islamic Guidance collaborate to implement the decisions of the council. The objective was to create a network of organizations to infiltrate and seemingly represent the Iranian community abroad, and promote policies favorable to the Iranian government. Tehran anticipated that this strategy would neutralize opposition activities abroad and legitimize the new lobby. State-sanctioned Iranian newspapers started a campaign to promote Trita Parsi and NIAC. Pro-government publications outside Iran followed suit. The former head of the Iran interest in Washington, Ambassador Faramarze Fathnejad, was thrilled about Trita Parsi’s efforts and NIAC, highlighting11 “the importance of relations with Iranian organizations in the U.S. and specially pointed to NIAC and his young leader who is a consultant to CNN and has been very successful in his efforts.” The Iran Ambassador even claimed 20,000 members for NIAC (while only 150 is claimed by NIAC itself)! But token rhetorical support would not alone turn an inexperienced graduate student and a corrupt Washington politician into a lobbying enterprise. Entities with ample financial resources and direct access to Iran’s top leaders had to enter the scene. Understanding the NIAC’s activities in the US necessitates familiarity with Trita Parsi’s main partner in Iran, Siamak Namazi, one of the most important figures of this new lobbying enterprise and a prominent member of the Iranian oil Mafia. Namazi, along with his sister Pari and brother Babak, control the Atieh enterprise12 in Iran and its three sister companies Atieh Roshan, Atieh Bahar and Atieh Associates, as well as numerous other direct and indirect partnerships, including13 Azar Energy, Menas companies in England, Atieh Dadeh Pardaz, FTZ Corporate services and MES Middle East Strategie.12 Particularly noteworthy is the fact that Baquer Namazi14 (the father) is the Chairman of Hamyaran, an umbrella organization for the NGOs in Iran – a man of considerable influence in the internal and foreign affairs of the country. The most recent debacle of Atieh enterprise was in March of 2007, when the CEO of the French oil company Total SA17 was charged for bribery of Iranian high officials to secure contracts. Total is one of the major customers of the Namazi’s Atieh enterprise and is mainly represented in Iran by Atieh and its affiliate companies. Tens of millions of dollars of bribes were paid by Total through individuals and third party corporations. Tehran’s trust in Namazi is elucidated by the fact that his enterprise provides the network and computer services for almost all Iranian banks, parliament, and other important institutions. Namazi’s groups monitor18 nearly all Iranian economic or political activities and have access to the country’s most sensitive data. This is a clear indication of his prominent place inside the inner circle of power in Tehran. While representing Tehran, Namazi, disguised as a scholar,19,20 travels to the US to seemingly pursue academic activities through think-tanks close to the Iranian regime. This link between the Iranian oil Mafia and “scholarly” pursuits in the US is hardly isolated. 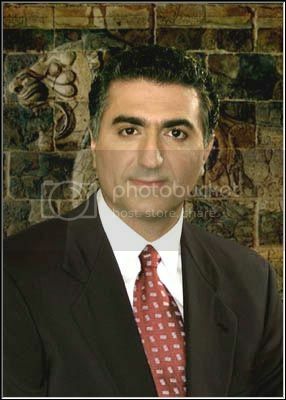 Three former Iranian deputy foreign ministers currently live in Boston posing as “scholars:” Mohammad Mahallati21 who was also the Iranian ambassador to the UN in the late 1980s, Farhad Atai and, Abbas Maleki.22 In addition to his diplomatic past, Maleki has been one of the most important figures within the Iranian oil Mafia. • To have the appearance of a citizen’s lobby. • To mimic the Jewish lobby in the US. • To impede Iranian opposition activities. • To infiltrate the US political system. • To improve the image of the Iran’s government abroad. In their report, Namazi and Parsi admitted that the Iranian community by large rejects the clerical regime and there is no hope that this community will help a pro-regime lobby in the US. This group’s [Iranian Americans] role has not been utilized anywhere close to its potential, however, for several reasons: A good portion of them were against the IRI [Islamic Republic of Iran], therefore would not do anything to help. The point is, the said group [Iranian Americans] was not about to form a lobby group that would benefit the establishment in Tehran, or benefit the Iranian-Americans themselves as a community, nor was it for the most part interested in forming a pressure group against the Islamic Republic. We [NIAC’s founders] found that most Iranians do not want to get involved in politics because of their experiences in Iran during and after the revolution. They have come to this country to make a better life for themselves and their children and don't want to get involved. The lack of genuine participation from the Iranian-American community in this lobby has been overcome with a sophisticated machine of professional lobbyists and “friendly” circles who favor a rapprochement with the Iranian regime. Creating similar types of seminars and intern opportunities to Iranian-American youth may not improve Iran-US relations in the short run, but it will help integrate the Iranian-American community into the political life of America. In the long run, a strong and active Iranian- American lobby, partly established through these seminars and by the participants of these programs, may serve to ensure that the US and Iran never find themselves in violent opposition to each other again. The conflict between Iran and the West on Iran’s nuclear file has entered a critical state. The government must now utilize all the possible resources to defend the national interest. In this, we have not paid enough attention to the potentially significant influence of the Iranian American society in moderating the extremist policies of the White House. In comparison of this untouched potential to the influence of the Jewish lobby in directing the policies of Washington in supporting Israel, we see the difference between what is and what could be. I propose that we should start showing up to the leadership training seminars and other events organized by the American-Israeli Political Action Committee (AIPAC) for their youth. Not only will this create an opportunity to learn the fine skills of community organization and grassroots lobbying, but it also takes away from AIPAC's ability to spread misinformation about Iran through a deliberate campaign to further its own political agenda. Our group does not do any lobbying at all. We do not contact the Congressmen to support or oppose a bill. The NIAC helped persuade a dozen conservative House members to sign a letter to President Bush earlier this month calling for unconditional negotiations with Iran's regime. The NIAC members have educational and experimental knowledge on the lobbying process and politics in America.
. . . we must establish connections on Capitol Hill to establish early-warning systems about proposed votes or bills that may oppose the best interests of Iranian-Americans. Bob Ney, Roy Coffee, and Dave DiStefano arranged numerous workshops, training classes, seminars and speeches in which they themselves and others with experience prepared members and affiliates of NIAC to lobby and influence Congress. Parsi, Namazi and Ney organized public gatherings and discrete and exclusive fundraiser events (with $1,000 plates). They developed training manuals on lobbying. Trita Parsi, Namazi and company fully intended to infiltrate the US Congress. Its methods included both engaging unsuspecting Iranian-Americans working in various Congressional offices and recruiting and placing young Iranian-Americans to serve as interns or pages in these offices by offering room, board and financial incentives. NIAC’s website brags of success stories in this venture. The young Iranian-American Press Secretary for Rep. Marcy Kaptur is drafted to help in improving the lobbying skills of NIAC members and affiliates. An Iranian-American student at the University of Minnesota receives a financial scholarship in his senior year and becomes an intern in Senator Norm Coleman’s (R-MN) Washington office.33 Another intern, a graduate of the University of South Florida, is placed in Congressman Jim Davis’ (D-FL) Washington, D.C. office. Expanding the operation to penetrate the US political system, NIAC has now formally implemented a paid trainee program and is actively in search for unwary Iranian- American youth. Since the early 1990’s, Tehran has embarked on developing a sophisticated lobby enterprise in the United States. Iran’s government has devoted significant manpower and financial resources to this cause. This lobbying enterprise consists of a complex, convoluted and intermingled web of entities and organizations with significant overlap of leadership and rank and file, and heavy involvement of the notoriously mafia-like inner circles of the Iranian regime. Disguised as scholars, many of the former Iranian government officials reside in the US and constitute an important piece of the lobbying machine. NIAC and its major figures, such as Bob Ney and Trita Parsi, are effective nodes of Tehran’s efforts to manipulate US policy toward self-serving ends. 1. Kiel, P. "Ney Faces Possible 2 Years Plus in Prison." 2. Bresnahan, J. "Casino Chips Sealed Ney’s Fate." 3. Dialog between Iranian Ambassador and Iranian exiles in Sweden. 4. Parvin, M. "Boxed In on Iran." 5. "The Iranian Presidential Elections and Its Implications for US-Iran Relations." 6. Javid, J. "Act as a community." http://www.iranian.com/Opinion/2002/May/Group/ (ed. Iranian, T.) (May 10, 2002). 7. AIC UPDATE - Vol. 2, No. 20.
http://www.thewashingtonnote.com/archives/001953.php (ed. Note, T.W.) (February 17, 2007). 9. "Council to defend Iranian expatriates: Iran's FM"
10. "Public Opinion in Iran and America on Key International Issues." http://www.sfcg.org/documents/iranus.pdf (ed. World Public Oppinion, S.f.c.g.) (January 24, 2007). 15. "Statoil chairman resigns from anti-corruption group board after Iran bribery case," Intl. Herald Tribune - Europe (October 20, 2006). 17. PIERRE-ANTOINE SOUCHARD, A. "Total CEO held for questioning over company's Iran activities." (March 21st, 2007). 20. National Endowment for Democracy. 24. Namazi, S. & Parsi, T. "Iran-Americans: The bridge between two nations," in DAPIA Conference (Cyprus, November 1999). 28. "The Iranian Lobby Becomes Active." Aftab Newspaper (December 28, 2006). 29. Namazi, S. If Mahdi doesn't come. 30. http://www.washingtonprism.org/eng/showarticle.cfm?id=50. Washington Prism (2005). Hassan Dai is an independent researcher and writer who worked closely with two experienced investigative reporters inside Iran to explore and expose Iran's lobbying enterprise in the United States. Read more articles in Foreign Affairs, National Defense. Although this American woman refers to herself as a "dumb blond" but she is quite the contrary and gives a good response to American liberals who have no clue about Iran and how their government (President Jimmy Carter) betrayed the progressive and modernizing government of Iran in 1979 when they along with other western powers gave full backing to the Islamists in line with a "greenbelt theory" ("belt of fundamentalist Islamic regimes") initially meant to halt Soviet expansion but also to keep these nations backward/poor and in so doing easier to "manage". There is some slight profanity here and there but I can fully relate with this person as I know the frustration one can build up when dealing with thick liberals who shamelessly support the savage Islamic Republic occupying Iran. My personal opinion on AhmadiNejad's visit to Columbia is that no terrorist leader should ever be given the opportunity to take advantage of the freedoms we take for granted especially when they themselves deny it to the people they rule over. AhmadiNejad used the podium given to him at Columbia to spew out his usual Islamist rhetoric and could not give a dime about any "insults" which where directed at him - in fact he used those "insults" to his own favour. The terrorist Islamic Republic has to be thrown out of the UN and its officials expelled/barred from entering free and civilized societies. Inviting him to a prestigious institution and insulting him is not going to help the Iranian people to rid themselves of these Islamists nor is it going to stop these madmen in their quest to acquire weapons of mass destruction. More importantly tough sanctions targeting institutions or front organizations of the Islamic Republic need to be imposed and direct financial/technological support given to the Iranian people to empower them and strengthen their resolve in their goal to overthrow this occupying Islamist regime.